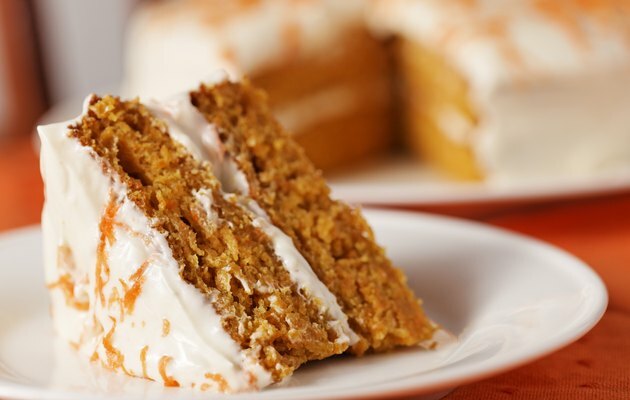 You may think carrot cake is healthy since it contains a vegetable, but this dessert is usually loaded with oil, butter, cream cheese and sugar, as well as carrots, making it hard to fit into a low-calorie diet. Choosing a one-layer version of the cake or making your own healthier version can help you cut back on the calories you consume when you indulge in a slice of carrot cake. A slice of a traditional 9-inch, two-layer carrot cake with cream cheese frosting can contain as many as 854 calories, with 480 of these calories coming from fat. Opt for a slice of the single-layer version of carrot cake and you'll still be consuming 670 calories, with 420 calories coming from fat. Reducing the oil by half in the cake batter, eliminating the butter in the cream cheese frosting and adding crushed pineapple and nonfat buttermilk to the cake batter to keep it moist results in a single-layer carrot cake with 342 calories per slice, of which 153 come from fat. Using only a drizzle of frosting on a similar cake made in a fluted, ring-shaped pan can reduce the calories further so that your cake has only 210 calories -- with only 45 calories from fat.